Simple Web Server - Felix John COLIBRI. We will present here a simple web server and the corresponding simple web browser. The brower will request an Web page, the Server will send it back, and the Browser will display the text of this page (as an ASCII text). We will use the basic Windows Socket library, and a small class hierarchy. 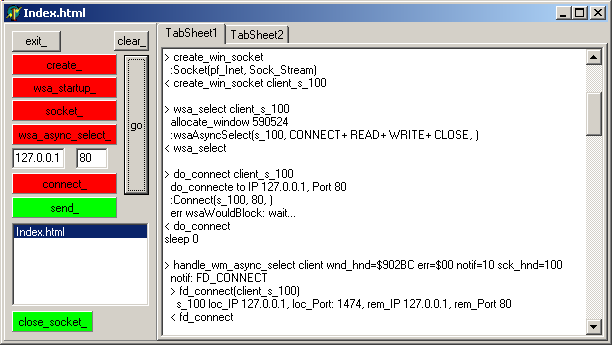 a server socket with Socket, Bind, Listen and CloseSocket and a Windows message handler receiving fd_accept, fd_write, fd_read and fd_close notifications. The fd_accept notification is used to create separate sockets for each incoming client, and each of those socket performs the actual communication with the Client. Our goal was to separate as much as possible the Client part from the Server part. Here is the result. when a Client connects, the fd_accept notification will be used to create a c_server_client_socket and add it to the m_c_server_client_socket_list. note that the server itself never sends or receives any data. But all the c_server_client_sockets will use the c_server_socket message handler. So the handling of fd_write, fd_read and fd_close which are sent to one of the c_server_client_socket, have to be monitored in the c_server_socket.handle_wm_async_select message handler. once this c_server_client_socket is found in the list, the data is read into its reception buffer. 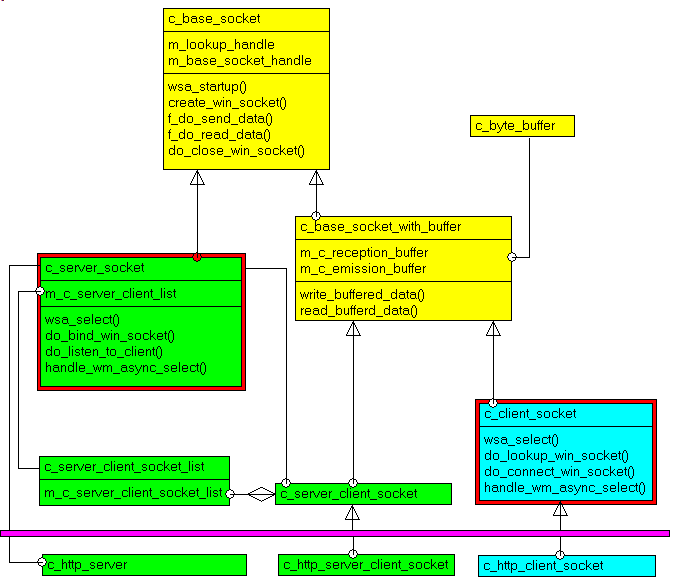 the Delphi tServerSocket handles all received bytes in this class (the server client socket delegates reception and emission events to the server socket class). When we implement any protocol, most of the protocol specific handling will be placed in the server client socket. And we must keep the received bytes and analyzed parameters on a per server client basis. So this organization forces us to duplicate the server client socket objets and their container list in each protocol application. Therefore we chose to keep the reception and emission in a specific c_server_client_socket class, which can easily be derived. This will now be presented. When we implement any protocol (HTTP, POP2, or custom protocols), we try to keep the protocol independent part in the general socket classes, and put the protocol specific parts in derived components. The UML class diagram shows the derived class at the bottom, below the purple line. We will illustrate this specialization with the HTPP protocol, implementing a simple server and browser. Since the task is so easy, we did not derive a specific c_http_client_socket class, and handled everything in the Browser From. The Server receives the page requests and sends the pages to each Client. This vertical organization eases the derivation of classes for specific TCP IP protocol applications. this "vertical" socket library is not supposed to be a better socket library implementation. But with the the horizontal layer we found more difficult to separate the server part from the client part. in addition, we did not try to minimize the communication between the layers. In a well built library, the user project is supposed to just call Run and OnFinished and everything in between is performed behind closed doors. On the contrary, we allowed every event to percolate up to the user. So we can watch when the connection was established, when data was received and so on. This would not normally be displayed on a user Form. we did not try to implement all socket possibilities: UDP, blocking mode etc.